What happened in 2006 with team Fauquier is still occurring today! That’s right - to win the first level post season tournament has become all so common for team Fauquier. In fact, through the past ten years that the Falcons have participated in Conference / Districts play they have won nine of those post season events - a tournament that was named Districts for many years which the VHSL now calls Conferences. But to dwell on this even more, in some sense one could classify team Fauquier as a Dynasty program - if not then what would you classify it as? Can any other sports program have a case in comparison – no reason to argue with anyone at this point as the nine first place Conference and Districts trophies are evidence of the team’s success. Going into the final round of the 2015 Conference, team Fauquier had 219.5 points and the closest other two teams were Liberty HS. at 186.5 and Eastern View HS. with 185 points. With team Fauquier advancing 12 wrestlers on to the finals this made for the point spread much too large for any Conference foe teams to surpass Fauquier. 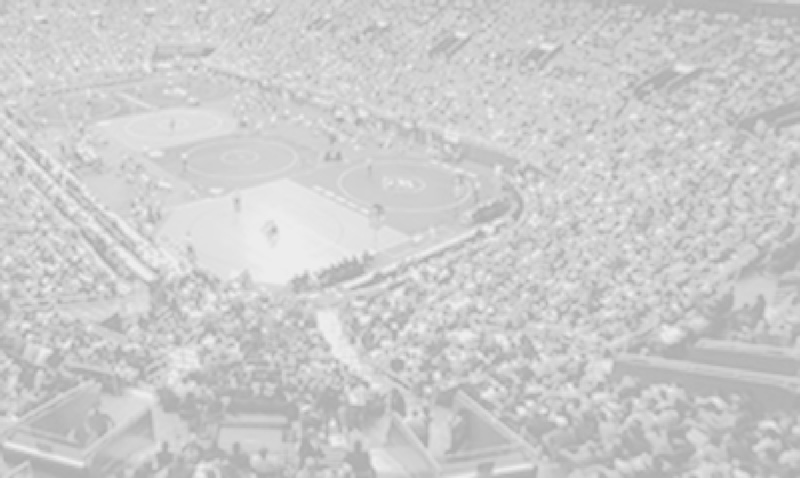 Having 12 wrestlers on deck during the finals one’s mind set changes a little – for example as a coach or an athlete you may not have to worry about the team score as much which in some manner is part of all sports. But having 8 to 9 District champs in past years must have had Coach Fisher thinking if his 2015 team could achieve these same standards – and that’s just what they did. 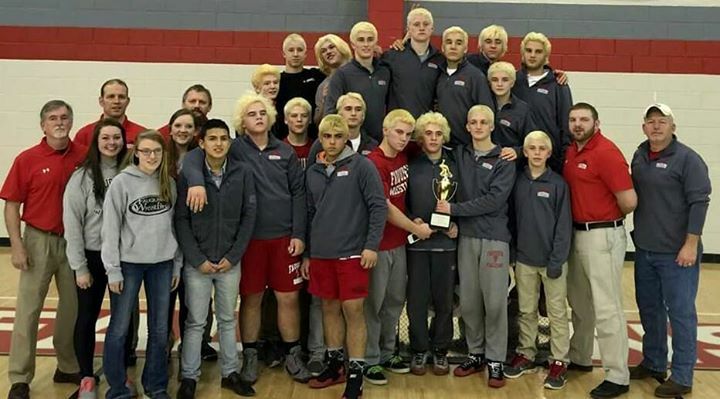 Fauquier ended up with 7 Conference Champs and 5 runner-ups as the tradition continues by sending all 13 wrestlers onto Regionals – which is second most all time compared to the 2011 team where they sent 14 wrestlers. In addition, earning 252.5 points for the 2015 championship also became second on the highest points earned in any Conference or District Championship. One of the highlights of the 2015 tournament was to witness Matt Raines win the Conferences / Districts for the fourth straight year in a row, etching his name alongside four other Fauquier wrestlers that have done the same. Matt Raines won his 138 pound final match with a 13-0 win over Mark Weinstock of Chancellor. Raines wrestled Weinstock in the post season last year as they faced each other in the 4A state finals with Raines winning all matches. Junior Garrett Tingen also is on track to obtain the status of Raines but we will have to wait for another year as he currently is a three time the Conference / Districts winner. Tingen won his 152 pound final match on Saturday evening by sticking Kaden Woodward of Eastern View in the second period. Tingen was also the only Fauquier wrestler on the day to record two pins. One of three Falcons who are returning Regional and State Champs, he will continue with his quest next week at Regionals. The 120 pound weight class had Senior Daniel Ariola also earning a win in the finals to become a two time Conference Champion. Ariola won a 5-1 match over Kraig Johnson of King George and gave Johnson limited opportunity to score during the match. Ariola had lost to Kraig Johnson at the Conference Duals during the season as he battled to join the seven other team mates on top of the podium at day’s end. The 160 pound finals had a classic county rival match-up between Clifford Harrison paired with Cameron Yates of Liberty. Harrison won a 5-0 match earning points in each of the three periods. Harrison, a junior, also joins Ariola in becoming a two time Conference Champion winning it last year in the 152 pound weight class. Harrison, one of the five returners that placed at the 4A States last year, also has his eyes set on getting to the state finals. Other Conference 22 winners include sophomore Tyler Foster who won the 113 pound weight class by beating Cliff Conway of Courtland 4-2; the 170 pound Senior Vito Camarca with a 9-0 win over Parker Utley of Eastern View; and the 195 pound Senior Andrew Smith with a 10-1 win over Bryce Willems of Eastern View. These three wrestlers showed the same mat skills and it was apparent that they were pushing and controlled the action through all periods. 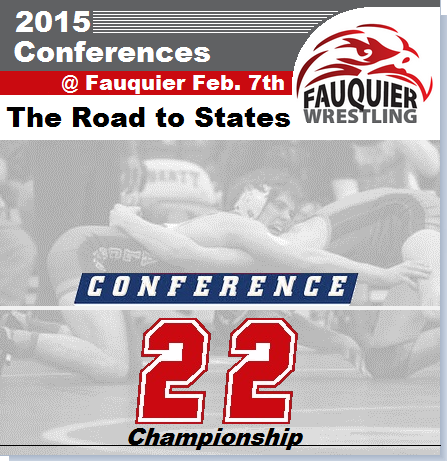 Each wrestler, Foster, Camarca, and Smith all won the 2015 Conference tournament for the first time. Fauquier would also have five other wrestlers who participated in the finals but lost. The 106 pounder Kyle Budd, 126 pounder Camden Franklin, 132 pounder Kyle Roche, 182 pounder Eric Lemus and 285 pounder Thomas Palmer all took 2nd place. But their efforts to win their semifinal round was huge as it assisted with the team earning final placement points that helped to keep Fauquier on top. Q: How does the 2015 Conference title compare to the others you have been a part of as the head coach of the Falcons? Winning this event 9 of 10 years is something special. Coach Fisher: It certainly is… It says a lot for our program and support. We have had coaching changes over those years, but the infrastructure has remained consistent which has been a key factor in that success. Q: Can you explain how hard it is to become a 4X Conference Champion? We witnessed Matt Raines complete the sequence this year. Coach Fisher: Well the numbers don’t lie. We have not had many (five now including Matt) in the history of Fauquier, it is a very difficult thing to do in any era. Q: For the past few years team Fauquier has had 8 to 9 Districts Champs at those events. With the bar being raised at a very high level - do you have any personal goals as a coach to continue to try to get the team to break team/school records? Coach Fisher: My goals are to get those guys through to states that are not necessarily on the radar screen Ie, not in the rankings, but I know they are capable of battling with the ranked guys and knocking them off. I have been saying that I want to take an army to states, and I need everyone that we can get there. Q: Team won the Regional title from 2010 through 2013. Taking a 2nd place last year (2014) what does this team need to do to bring home another 1st place Regional trophy this year? Coach Fisher: Yeah, that fact is not lost on me. We had a couple guys last year that didn’t score the points that were available to them and that cost us the title. We need each of our 13 guys going in with the mindset that they are going to battle for every match point for 6 or more minutes. If we have all 13 guys pushing each match for bonus, advancement and placement points, we will have the Region trophy that we want. To be in the hunt for the Regional and State title has become standard practice for team Fauquier as this first level event had all wrestlers in check to qualify for the Regional tournament once again. The more wrestlers that do qualify for the Regional championship gives any team hope that they can earn the point value to be on top. As the 2015 Conference 22 Championship trophy is earned by team Fauquier they do look solid as they make that run for the Regional and State title in the next two weeks. What’s Next: Fauquier will travel to the VHSL Regional 4A meet at Amherst HS. on Friday, Feb. 13th. This meet will be a two day event as wrestling will start on Friday Feb. 13th at 4:30pm and the final rounds will be on Saturday Feb. 14th. More details of the event will be posted later this week. Round Results: Fauquier went 7 and 5 with 1 pin. Round Results: Fauquier went 12 and 1 with 6 pins.